Pollution is one of the biggest contributors of biodiversity loss from human overpopulation and is defined as the fouling of the environment through the introduction of harmful or disruptive contaminants *1. Pollution has a profound effect on the health of the environment and the organisms that live in it, especially the ones most sensitive to chemical changes, like fish and frogs. Pollution is also exclusively anthropogenic is source and as the human population continues to rise, so does the level of pollution. Coal-fired power plants and car exhaust pump out carbon dioxide that contribute to green house gases (GHG) attributed with climate change and ocean acidification. Agricultural farming of cattle releases high levels of methane gas through bovine gas emissions, which also contribute to climate change as a GHG. Chemical pesticides wash off our soil, into the water we drink and become absorbed by the food we eat. Industrial chemicals have built up in our food chain to the point that 48 states in the US have warnings to limit consumption of fish due to the high levels of mercury found in them *2. Noise pollution, like that of military sonar testing, has lead to the death of countless marine cetaceans *3 around the world. 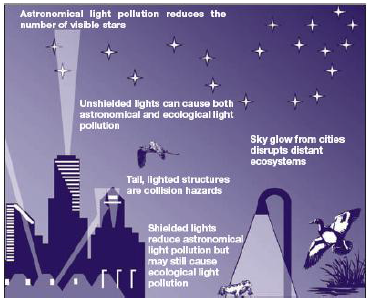 Light pollution from artificial sources has changed the migration of species from birds to zooplankton (those tiny little animals that are the basis of all marine life in the ocean), disrupting reproductive patterns and food cycles. It also disrupts hatchling sea turtles that are drawn toward the humans, and domesticated animals. Litter pollution from product and food packaging is a large problem in urban areas where it often washes into water ways, causing wildlife deaths through entanglement and poisoning through ingestion. Pollution is an insidious culprit to biodiversity loss worldwide. The range and scope of the problem is vast and complicated, thus the focus here will be narrowed to briefly discussing current issues with plastic litter in oceans. The history of plastics began in 1839 with the use of natural rubber, by the 20th century the world had discovered synthetic plastics *4, and today there is very little that has been produced, used, or consumed that has not come in contact with plastics. Major concerns regarding plastics today is their persistence in the environment caused by an inability to biodegrade quickly *5, chemical leaching and bioaccumulation in food chains, and loss of biodiversity and ecosystem function. In 1997, while sailing through the North Pacific Ocean, Charles Moore discovered the Great Pacific Garbage Patch. A free floating island of plastic bags, toothbrushes, lighters, fishing line, and debris that is estimated to be 62,000 square kilometers wide and thirty meters deep *5. In a study published by Moore in 2001, the mass of plastic found out number plankton by approximately six to one *6. Washed out to sea from North America and Asia, this marine debris kills hundreds of thousands, if not millions, of animals each year through entanglement, toxic poisoning, and indigestion of small plastic fragments that are mistaken for food. Ingested plastics most likely cause death in birds by obstructing the digestive tract which leads to starvation from a false sense of satiation, irritating the stomach lining, and cause deficiencies in putting on fat stores necessary for migration and reproduction *7. In a two-year study of Laysan Albatross chicks on Midway Atoll it was found that of 251 dead or injured chick necropsies, only six did not contain plastic in the digestive tract *8. The IUCN, International Union for Conservation of Nature has listed the Laysan Albatross as a species vulnerable to extinction *9. Estimates blame marine debris, 90% of which is plastic, for killing one million seabirds and roughly one hundred thousand marine mammals and turtles each year *10. However, this is not the only cause for concern with regard to plastic ingestion. In laboratory experiments on animals, chemicals found in plastic have been shown to cause a multitude of problems such as obesity, lowered sperm count, prostate tumors, accelerated sexual maturity, breast tumors, and miscarriages from the chemicals they leach that are absorbed *5,*11. One such chemical is Biphenyl A, or BPA, which mimics the natural hormone estradiol, has been used ‘to manufacture polycarbonate plastic, certain dental sealants, and the resin lining of most food and beverage cans’ since the 1950’s *11. Also found in pesticides, flame retardants, recycled paper, baby bottles, and plastic eating utensils *5, BPA has shown to ‘estrogenize and block testosterone’ in males during fetal development *11. Ingestion of plastic items at the base of the food web acts as a biomagnifier of these chemicals in species higher in the food chain, including humans. Currently, about 4% of the world’s oil is used in plastic production and is expected to increase, surpassing three hundred million tons in annual production by 2010 *12. This is not the only pollutant whose production is increasing. Between 1975 and 1990 worldwide pesticide sales increased tenfold *13 and as the human population grows and cultures are homogenized into becoming more ‘Western’, everything from plastics to pesticides will increase along with it. The effects of which are being witnessed by the global mass extinction of species worldwide, begging the question ‘In a western world, is there room for biodiversity’? WHAT PLASTICS CAN WE SUBSTITUTE TO MINIMIZE DETRIMENTAL EFFECTS TO OUR MARINE ENVIRONMENT? “Overconsumption, resource utilization, pollution and overpopulation are given as examples of the most basic problems for the environment in the future. A more sustainable future can be achieved by producing more sustainable products causing fewer environmental impacts (Rudnik, 2008). The invention of plastic opened up opportunities in numerous fields. This disposable material continues to be used by billions of people around the world. Present society has an unrealized reliance on everyday plastic use. Though convenient, the fate of this revolutionary product went unrealized for several decades (Derraik, 2002). Recent events have triggered concern for our lifestyle, as old plastics are making reappearances in our environment. We are at a critical stage in time where our choices have profound impacts on our future generations. 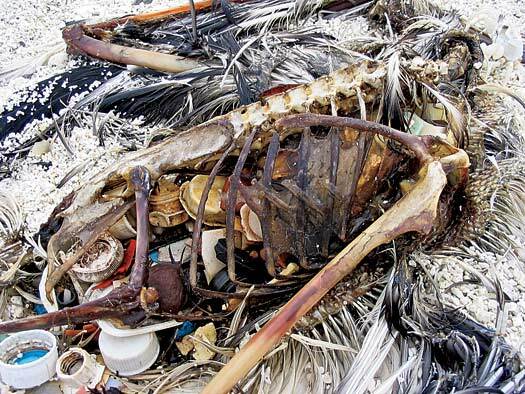 An estimated 100,000 marine animals and more than one million seabirds die from entanglement or ingestion of plastic marine debris each year (Ferris, 2009). Scientific studies have also revealed serious health concerns for wildlife and for humans (Staley, 2008). Rather than overlooking the detrimental impacts of plastic created in the past, it is our moral duty and in our best interest to correct our actions. With today’s technology, alternatives to plastic are being developed. By replacing some petroleum based plastics with degradable plastics, we can greatly reduce the negative impacts of these man-made products. Here, I will discuss the history and creation of plastic and its multiple uses. The fate of used plastic and the impacts on the environment and on people will be revealed. In order to minimize harmful impacts of petroleum derived plastics, alternative materials must be substituted, where feasible. These will be recommended, as well as immediate actions which can be taken by us all. During the 1800s, several polymers and resins were produced from celluloid and formaldehyde, for electrical insulation and other various uses (Brydson, 1989). It was not until the 1930s that vinyl plastics were created from petroleum products. The accidental discovery of polyethylene, as well as polyvinyl chloride (PVC), initiated the worldwide plastic industry (Brydson, 1989). The development of thermoplastics was utilized during World War II for parachutes, aircraft parts and clothing (Bryan, 2009). Plastics became more specialized as they were used for automobiles, furniture, piping, televisions, food containers and other general purposes (Brydson, 1989). The convenience of plastic expanded in household uses by the 1950s, as the idea of a “throw-away” society was advocated by media, such as Life Magazine (TED-Prize, 2009). This improved, affordable lifestyle quickly gained popularity. A scare arose in 1973 as the United States (US) had complications with oil importing nations (Licklider, 1988). The oil crisis led to increased oil prices and a drop in the economy. This directly affected the plastic industry, as plastics are a bi-product of petroleum. As international relations were resolved, the plastic industry was able to continue the development of affordable products to global consumers. This short-term crisis should not be overlooked; it may provide a glimpse of our near future situation (Licklider, 1988). The graph below shows our current status, which appears similar to that of the 1973 crisis (Fig.1). 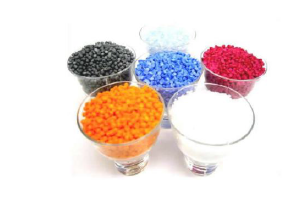 Virgin plastic resin pellets are petroleum based polymers, made of linked monomers, which range in size from one to five millimeters in diameter (CEPA, 2009;Staley, 2008). Depending on their chemical additives, they vary in color (Fig. 2), shape, rigidity and environmental resistance (CEPA, 2009; Ferris, 2009). One pound of high density polyethylene (HDPE) can be composed of 22,000 pellets (CEPA, 2009). Resin pellets are shipped to factories to be melted and molded into various forms, using injection molders and other machinery (Delaney-Manufacturing, 2008). Between 1960 and 2000, there was an increase in global production of plastic resins by 25-fold (C. J. Moore, 2008). These polymers have a high molecular weight resulting in extremely slow biodegradation (Delaney-Manufacturing, 2008; C. J. Moore, 2008). For example, water has a molecular weight of 18, whereas the common plastic type, polyethylene, has a molecular weight of over one million (Delaney-Manufacturing, 2008). Today we annually produce 5.5 quadrillion resin pellets worldwide (C. J. Moore, 2009). Plastics can remain in the environment for up to 1,000 years after production (Staley, 2008). Since the 1950s, over one billion tons of plastic has been disposed of (Weisman, 2007). Plastics are durable, strong and cheap to produce. These properties are the reasons why plastics pose a serious threat to the environment (Derraik, 2002). Of the 100 million tonnes of plastic that are produced every year, ten percent makes its way to the sea (Greenpeace). Around 80 percent of plastic marine debris is land derived and 20 percent comes from ships and platforms (Greenpeace). Less than five percent of plastic actually gets recycled (C.J. Moore, 2008). Even small, unnoticeable plastic fragments can result in serious harm. Plastic “scrubbers”, found in hand cleaners and airblast cleaning tools, are usually smaller than 0.5 millimeters in diameter (Derraik, 2002). These tiny polyethylene and polystyrene scrubbers physically strip paint off metallic surfaces and help clean engine parts. In the process, they may be contaminated with heavy metals. Though the solution is treated at a sewage treatment plant, most of the plastic scrubbers make their way into marine waters, floating on the surface and being dispersed by currents (Derraik, 2002). Unfortunately, plastic debris can be found in even the most remote places. Along several New Zealand beaches, counts of over 100,000 pre-production resin pellets per meter have been found (Derraik, 2002). Even in isolated, South Pacific islands far from civilization, amounts of plastic waste found are comparable to industrialized western coastlines(Derraik, 2002). 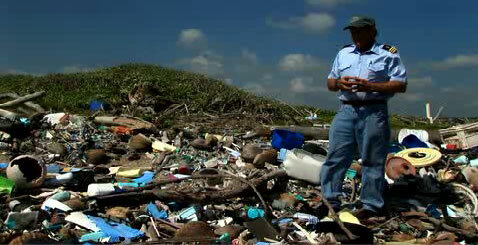 In a study of nine beaches in the Hawaiian Archipelago, plastic was found at every location (McDermid, 2004). Of the debris evaluated, 72 percent was plastic. Of that, 11 percent was in resin pellet form, by count (McDermid, 2004). The main environmental problem with plastic debris, is that the strong polymer structures do not break down, rather, they break apart into smaller and smaller pieces with the aid of photodegradation (C.J. Moore, 2008). Though large pieces of plastic are an obvious eyesore, it has recently become apparent that micro-debris is an even larger concern. These bits of floating plastic debris are easily mistaken by marine animals for food (C.J. Moore, 2008). They are eaten by filter feeding organisms and ultimately make their way into higher trophic levels (Derraik, 2002). Also, plastic litter doubles the incidence of alien biota dispersal by providing rafting opportunities (Katsanevakis, 2007). If a worldwide mixing of biotic species occurred, Earth’s species diversity may decline by as much as 58 percent (Derraik, 2002). Small, encrusting species such as algae, hydroids and diatoms take advantage of the long lasting plastic particles. In the 1970s, it was discovered that the bryozoan, Membranipora tuberculata, migrated from Australia to New Zealand, across the Tasman Sea on plastic debris. This same species was found on plastic washed up on the Florida coast, in the US. Drifting plastics can help increase the range of a species into an area where it was previously non-existent. This could lead to detrimental effects on the new ecosystem (Derraik, 2002). A Southern California research project sampled the density of neustonic plastic particles in coastal waters just offshore (Moore, et. al, 2002). “Neustonic” refers to the collection of microscopic organisms which inhabit the surface of a water body (Farlex-Inc., 2009). 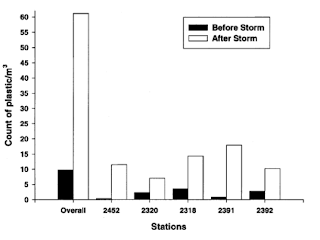 Five sites were sampled before and after a rainfall event (Moore, et al., 2002). Samples were taken using a manta trawl net with 333 μ mesh lining. The net was towed at the surface at a slow speed along specified transects. These samples were separated into plant, plankton, plastic and other debris. Wet and dry weights were taken of the plastic, plant and plankton particles. As you can see in the chart below (Fig. 3), after a storm the number of plastic particles spiked up to seven times greater. The average size of plastic debris was smaller after a storm. The average plastic to plankton ratio by density exceeded three to one. The most common types of plastic were found to be from garbage and sandwich bags, Styrofoam, fishing line and resin pellets. Due to the alarming results of this study, Los Angeles county has installed barrier nets on river outlets and set quotas for waste from certain watersheds (Moore, et al., 2002). It can be assumed that similar results will occur at other industrialized locations around the world. Having knowledge of major sources of these pollutants will better assist environmental managers and policy makers in the future. There are several legal measures which have been taken to help reduce the amount of unnecessary waste being thrown overboard off vessels at sea. Probably the most important piece of international legislation is the 1978 International Convention for the Prevention of Pollution from Ships (MARPOL) (Bean, 1987). MARPOL recognised that the large amounts of trash from vessels were controllable and should be managed (Derraik, 2002). Later, Annex V of MARPOL was enacted to prohibit at sea plastic disposal and restrict garbage discharge. Annex V applies to all vessels, including small, recreational watercrafts. Though this legislation entails strict laws, they are easily broken. An observer program aboard foreign fishing boats in Australian waters discovered that around one third of them did not comply with MARPOL. Enforcing international law in such large areas poses quite a challenge. It is debatable whether the implementation of Annex V has reduced the number of marine entanglements or the amounts of plastic debris in the ocean (Derraik, 2002). Captain Charles Moore, founder of Algalita Marine Research Foundation (AMRF), discovered a vast area of swirling marine debris, while sailing from Hawaii to California in 1997 (Staley, 2008). This so called “garbage patch” extends from the equator to 50 degrees north (Fig. 4). Improperly disposed rubbish travels east from Japan and garbage from the US heads south towards the Philippines (TED-Prize, 2009). The oceans’ converging currents form massive sub-tropical gyres, where floating debris is concentrated (Staley, 2008). The amount of plastic fragments in these large high pressure systems had doubled in one decade. As of last year, it is estimated the size of the largest vortex of trash is 620,000 square kilometers. The majority of the garbage is from land (Staley, 2008). 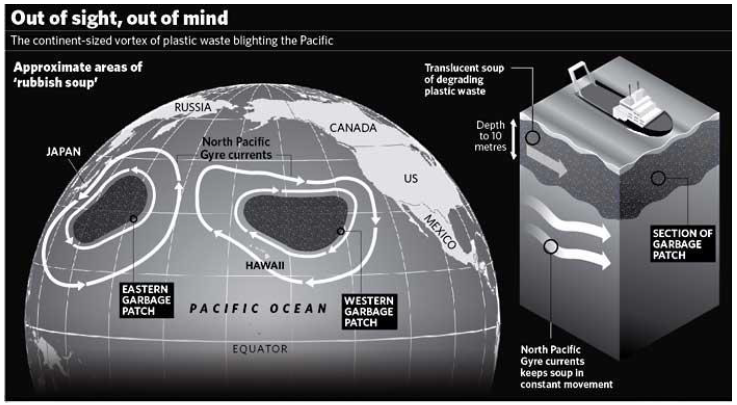 Studies in this central North Pacific gyre have revealed a staggering six kilograms of plastic to every one kilogram of zooplankton (C. J. Moore, 2008). 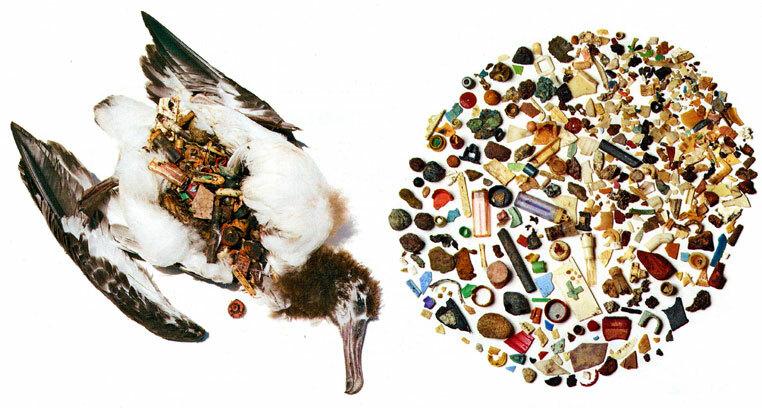 There is still much we do not understand about the impacts of plastics on our marine ecosystems (Derraik, 2002). The expansion of plastic use coincides with human population growth. It is known that at least 267 species are affected by plastic marine debris. This includes: 86 percent of all sea turtles, 44 percent of seabird species and 43 percent of marine mammal species. Another potential problem is that some plastics sink and settle on the sea floor. The bottom of Tokyo Bay is comprised of 80 to 85 percent plastics. This poses serious problems for the benthic organisms, such as entanglement and ingestion (Derraik, 2002). Each night, from the depths of the sea, 600 million tonnes of lanternfish rise to the surface to feed on zooplankton (Staley, 2008). These small, pelagic fish make up 90 percent of the deep sea biomass. While at the surface, they are consumed by squid, seals, whales and commercial fish such as swordfish, mahi-mahi and salmon. For the past 60 years, the ocean has been accumulating our plastic land waste. This floating debris is mistaken for zooplankton by lanternfish, birds, filter feeders and other marine life. Plastic is oil soluble and is known to readily absorb hydrophobic pollutants, such as PCBs and dioxin, a known carcinogen. Last year, a study in the North Pacific performed necropsies on 600 lanternfish. They discovered that more than half the fish had plastic in their gastrointestinal tract. One lanternfish, 6.3 centimetres long, had 84 plastic fragments in its stomach. These fish are not only being poisoned by eating plastics, they are unable to build up fat reserves needed for reproduction. A decrease in prey at the bottom of the food chain will create problems for predators which consume them. Organisms such as lanternfish are the “canary in the coal mine”. If the health of the marine ecosystem is compromised, so is all life on Earth. We cannot survive without it (Staley, 2008). Leatherback Sea Turtles, Dermochelys coriacea, have been in existence for 70 million years and can weigh up to 600 kilograms (Barreiros, 2001; Staley, 2008). The population off Vancouver Island has undergone a 90 percent decline over the past 20 years. These air breathing reptiles are prone to net entanglements and are also known to ingest plastic bags, which they mistake for their primary food source (Staley, 2008). Plastic shopping bags appear similar to jellyfish, as they fill out with water into a balloon shape when pushed by sea currents (C.J. Moore, 2008). In 2000, an accidental capture of an adult D. coriacea by a long-line fisherman allowed for a scientific necropsy (Barreiros, 2001). The animal was in perfect health except for pieces of plastic found in the anterior region of the intestine. These did not appear to cause apparent damage however, if the animal were to have lived longer, these may have caused lesions and tissue necrosis. This would typically lead to death with most marine animals (Barreiros, 2001). Midway Island, in the northwestern Hawaiian Island chain, harbours a nesting ground for over one million albatross and several thousand shearwater birds (Klavitter, 2006). 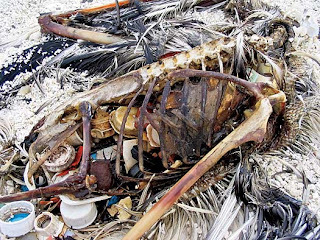 The stomach contents of 50 Laysan Albatross (Diomedea immutabilis) chicks revealed that 90 percent contained plastic in their upper digestive tract, as well as 50 percent of the adults (Fry, 1987). Twelve of 20 adult Wedge-tailed Shearwaters (Puffinus pacificus), also had plastic in their guts. The chicks generally have a high ingestion rate and low regurgitation rate. The adults are collecting plastic debris and feeding it to their young. These plastics cause more physical problems than chemical to the individual animals. The fragments are indigestible and block actual food items from passing to the intestine. This causes them to feel full while they are actually being starved of nutrients (Fry, 1987). Seabirds typically select small plastic particles between one and five millimeters in diameter which are mostly made of polyethylene, polypropylene and polystyrene (Fry, 1987). Many are in raw pellet form. Although some pieces found were as large as 20 by 80 millimeters. When a plastic ridden animal dies and decomposes, the plastic is released back into the environment to potential be eaten again. If these birds are consumed by predators, the plastic is passed on up the food chain (Fry, 1987). Long term health problems include “lowered steroid hormone levels, delayed ovulation and reproductive failure” (Katsanevakis, 2007). This is clearly a large concern for many of our marine species. Our marine animals are not the only vulnerable species to plastics released in our environment. Regardless of where it enters the food web; by consuming fish, whale meat or even eating with plastic utensils, contaminants absorbed by plastics, or plastic additives pose serious risks to humans (Staley, 2008). Because cellular mechanisms are so similar across all vertebrates, results of studies on mice and rats can be expected in humans as well. Chemical plastic additives found in your food containers, in dental fillings and plastic water bottles are detected in the blood of most people tested (Staley, 2008). Probably the most concerning plastic additive for human consumption is bisphenol A (BPA) (Raloff, 2007). These hard, clear plastics are used in items such as baby bottles and plastic ware. BPA is also a vital ingredient in epoxy resins used for lining food and beverage cans. This hard to avoid, largely unregulated material leaches into foods with age and when heated. A number of deleterious effects have resulted on experimental animals in hundreds of laboratory studies. Some effects of this estrogen-mimicking chemical are obesity, insulin resistance, lowered sperm count and precancerous changes in cells. “BPA blood concentrations associated with the animal effects are comparable to concentrations known to exist in people” (Raloff, 2007). According to a study at the Yale School of Medicine, BPA may impact the future fertility of the fetus a mother is carrying (Science-Daily, 2007). Last year the US Food and Drug Administration stated BPA was safe as it was currently being used, however they later agreed more research was necessary to determine its health effects (Science-Daily, 2009). 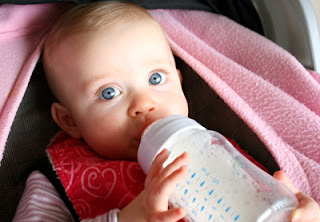 Chemicals can be ingested by human infants through breast feeding (Staley, 2008). These contaminants attach to the fats and proteins in breast milk. It is known that Canadian Inuit’s whose diet consists of fish, whale and seal, have high levels of mercury and PCBs in their blood. It is believed to cause adverse impacts on infants and fetuses (Staley, 2008). Due to scientific evidence of negative health effects, Canada recently became the first country to ban BPA in baby bottles (BBC, 2008). It is likely that as we continue these studies, plastic manufacturers will have to improve their products. It would be impossible to trace the chemicals in our bloodstream back to their sources. Numerous studies make it apparent that perhaps we should all limit our consumption of plastic contained foods and liquids and make a greater effort to prevent them from entering our environment. As environmental awareness expands, so does the need for consumer product technology. Currently, there are several alternatives for synthetic polymers, some of which are already on store shelves (Gross, 2002). These new products have to compete with less expensive, familiar items. Rather than relying on oil derived plastics, biodegradable polymers (BPs) can be produced from starch and cellulose. Contrary to popular belief, these BPs can be made sturdy, to last for long periods of time with multiple use. By altering the blend of additives, the properties can be changed. When properly disposed of, enzymatic microorganisms compost the material into CO2, water, humic matter and biomass (Fig. 5) (Gross, 2002). Besides from the obvious plastic debris which we can see accumulating in the ocean or lining our beaches, invisible, water soluble polymers also exist (Gross, 2002). Substances which are used in detergents, toothpaste and textiles can be replaced with water soluble BPs that already exist in today’s market. By using these alternatives, we can reduce our reliance on the oil industry, produce sturdy polymers with renewable, organic resources, and instill a cleaner, safer environment (Gross, 2002). Today, many restaurants use disposable materials rather than the traditional tableware, to avoid having to wash them (Razza, 2009). The amount of waste from fast food restaurants worldwide is unknown, however a survey in Italy revealed an estimated eight billion items were disposed of in 2006. Of this, 378 million items were disposable utensils. During a more recent study, two scenarios of disposable cutlery were analysed: a Life Cycle Assessment (LCA) of typical plastic ware, from use in a restaurant to disposal and a LCA of compostable cutlery. Though typical plastic cutlery is made of recyclable material, the separation process is difficult and expensive. Once the plastic is contaminated with food, it is no longer accepted for recycling. The experiment portrayed Italy’s normal disposal methods: 84percent waste goes to a landfill and 16 percent gets incinerated. Once the heterogeneous waste is buried in a landfill, the lack of oxygen suppresses enzymatic breakdown. When biodegradable cutlery is composted with food waste intermixed, the result is valuable organic waste which can be utilized for agricultural fertilizer. The alternative compostable cutlery produced the best results with the lowest impacts on the environment (Fig. 6). The amount of solid waste was reduced by four-fold (Razza, 2009). This adaptation in waste management is a key solution to our ubiquitous landfill dilemma. As consumers place more pressure on the plastic industry to become more environmentally friendly, the need for alternative plastics strengthens. The more available these products become, the cheaper they will be to purchase. An area of future research is in continuing genetic engineering to learn new possibilities for using cloned plant genes for synthesizing organic polymers (Gross, 2002). As we improve this technology, production processes become more efficient, reducing overall costs of the new products. We have an increasing need for retrieving carbon from renewable resources, rather than from oil reserves (Gross, 2002). By minimizing the amounts of traditional plastics produced, we can reduce the amount of waste destined for long-term landfills and harmful plastics which make their way into the environment. The petrochemical, succinate, is used as a diesel additive to decrease emissions, as a food flavour enhancer, pharmaceutical stabilizers and has many other applications (Potera, 2005). Recent research has created a new genetically engineered strain of Escherichia coli, which converts glucose, from corn, into a “green” succinate. The future goal is to obtain sugars from other agricultural wastes, such as cornstalks, and to create an environmentally friendly product which is more affordable than a petroleum based product. 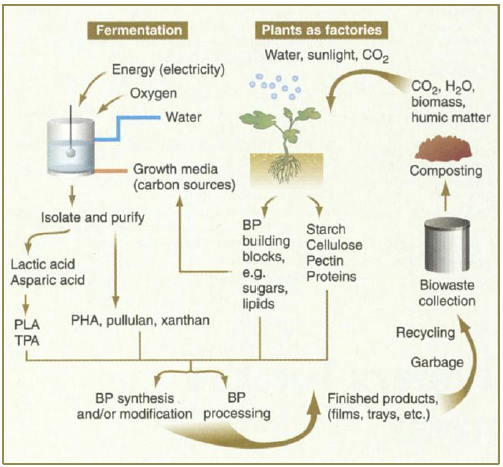 The Department of Energy (DOE) funded a program conducting fermentation research for future bio-refinery possibilities. Currently in France, succinate is being produced from wheat and sugar beets by DNP, the first company to commercially produce this chemical from biomaterial. DNP plans to open another plant in the US. Another beneficial outcome from biosuccinate production is the use of the greenhouse gas, carbon dioxide. Producers hope to utilize the carbon dioxide waste from ethanol plants, reducing environmental impacts and generating maximum economic benefits in the in the process. Several large corporations, such as Cargill and DuPont, have committed to using biomass fermentation to create their future products. Though there is still much research to be done, this motivation to create chemicals from renewable resources is a step in the right direction. Apart from relying on the plastic industry to create alternative polymer products, there are many other significant steps which we can take to limit the harmful effects of plastic in our environment. As consumers, we need to properly dispose of our household items. We need to be responsible shoppers and make an effort to purchase ecologically friendly products. Volunteer groups for beach and reef clean-ups are also an effective method to prevent litter from entering the ocean, as well as a means of promoting public awareness. Installing litter traps on drainages and regulating resin pellets lost by manufacturers are both very important actions, which will greatly reduce plastic marine debris. It is also important to reuse and recycle what we can. Only one percent of plastic shopping bags were recycled in the US in 2005 (C.J. Moore, 2008). 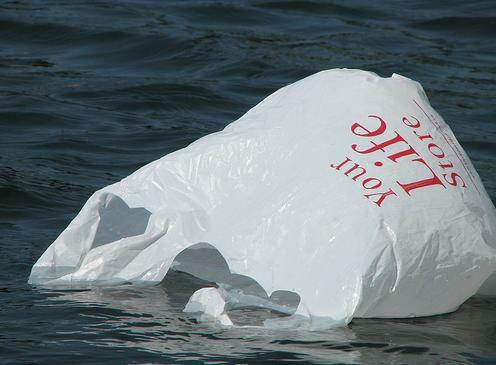 It is easier for consumers to simply throw them away and it is cheaper for manufacturers to create new plastic bags (C.J. Moore, 2008). A better alternative is to not use plastic bags at all. The plastic bag ban is becoming more popular around the world. South Australia recently banned these check out bags, in hopes of saving 400 million bags from entering the landfills (ABC-News, 2009). Only 17 percent of plastic water bottles in the US in 2005 were actually recycled (C.J. Moore, 2008). Rather than continuing our rate of using two million plastic beverage containers every five minutes, we can use stainless steel bottles instead (TED-Prize, 2009). Though the general population may be reluctant to change, the health of our future generations and our environment relies on it. Man has created half a century worth of plastic products, over one billion tonnes have been thrown to the environment. Though plastic was an initial convenience, the boom of plastic creation exceeded our ability to predict today’s situation. Over the last few decades, our wildlife has continued to take a toll and bear the impacts of our naïve actions. Visual impacts are more obvious, as hundreds of marine species suffer. Plastic pollutants affect every aspect of the food chain, including us. We must all adapt to a more responsible lifestyle to begin alleviating the impacts of our plastic waste. Today, we are aware of how our casual, disposable lifestyle has negatively altered our waterways, marine ecosystems and continue to fill our landfills. Virgin resin pellets accumulate along our shorelines, animal entanglements are increasing and we continue to lose deleterious plastic scrubbers to our environment. We have the technology and resources to replace a large portion of these detrimental synthetic polymers, which we rely on daily. We can substitute plastic cutlery, plastic wrap, garbage and shopping bags, food and drink containers, and many other items. We have an understanding of the importance of living sustainably. With the growth of the environmental movement, hopefully soon everyone will realize the importance of maintaining a healthy environment. Tomorrow, we should break the trend of our familiar routine and make a noticeable effort to become responsible consumers. Biodegradable products are only beneficial if they are allowed to biodegrade. Even water soluble BPs are broken down in waste water treatment plants, unlike traditional water soluble polymers. If everyone were made aware of how their daily activities altered the natural world, with which we are completely reliant on, it is my belief that much less plastic would escape to our environment. The more we contribute to the production of biodegradable plastics, the fewer synthetic resin pellets will be produced and lost by producers. Actions must be taken by individual citizens, manufacturers and the government in order to protect the health and biodiversity of our oceans. View Kristin's photography at kcmphotos.com or contact her at LinkedIn. The World's Number One Steroid Manufacturers! Welcome! We are in the world market now! With the world’s best steroid brands and original products, we are always at your service! DNP Purchase has been reported to cause rapid weight loss of 2,4-Dinitrophenol (DNP), but unfortunately it leads to a high adverse effect rate at an unacceptable rate. DNP is mostly sold on a number of different names as a weight loss / weight loss aid on the internet. Causes decomposition of oxidative phosphorylation; The classic symptom complex associated with the toxicity of phenol-based products such as DNP is a combination of hyperthermia, tachycardia, diaphoresis and tachypnea.